So I came across this recipe on Pinterest for “healthy” cookie dough. When I saw the list of ingredients I just HAD to try it. I mean how on earth could garbanzo beans ever taste like cookie dough? I don’t know how it works it just does. It was so good I made it for my sons preschool holiday party and it got rave reviews and several requests for the recipe. I changed the original recipe which included peanut butter and milk because the preschool is nut free and you never know what other food allergies people may have. 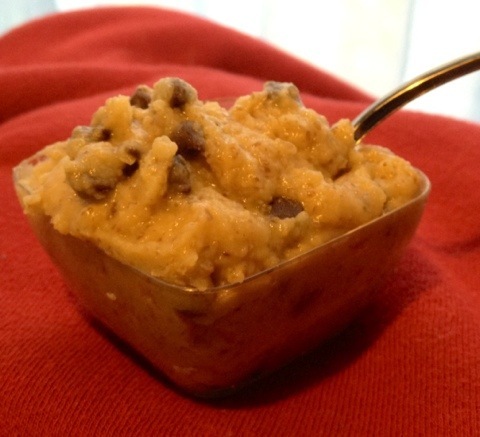 So here it is a vegan, gluten free, dairy free, nut free cookie dough dip recipe. Add all the ingredients to your blender or food processor except for the chocolate chips. Start with half the water add more as needed. Blend everything together until smooth. Add chocolate chips and enjoy! I served mine with gluten free/dairy free animal crackers, ginger snaps. and pretzel sticks.